Single story duplex with 3 bedrooms, 1 living room, 1 dining/kitchen combo in residential neighborhood in Nixa, Missouri. Home "feel" was consistently comfortable and non-distressed in all rooms and living areas. The owner of this home contacted us with a variety of claims including disembodied voices/whispering, feelings of dread and uneasiness, "doppelganger-type activity" where they hear each other's voices and very distressing messages being heard by both daughters (10 and 15 years old), especially the 10 year old (details of the distressing messages and names of daughters are withheld for privacy reasons, but their mom, our primary client, and grandmother believe this may possibly be a non-human presence). The girls' grandmother also lives in the home and reports hearing the same doppelganger style voices, being physically moved in her bed and has heard disembodied voices. Both daughters, the grandmother and our primary client (Lizzie, the mom of the two girls) have all had experiences in this home and report that this is the third home they have lived in where this activity has followed them. Being that the activity didn't begin upon moving into this home, we did not perform a background or history of the home/property. We performed a thorough EMF sweep through the entire home and found that the appliances and outlets in the home are very well insulated from EMF. Also, this being a duplex, we worried about possible audio spillover from the neighbors which share a wall with this family. We were told by both Lizzie and her husband that the duplex is "very well insulated" from noise associated with the neighbors and found this to be very true, much to our surprise. We also performed an initial sweep of taking pictures of every room, closet, etc before the investigation began. Again, at NO point did any investigator feel threatened or uneasy during the entire investigation. The home felt quite welcoming the entire time. While we cannot categorize any of our personal experiences as "paranormal", we did have a few that we were unable to debunk and definitely merit mentioning. We'll start with one big issue that we were able to debunk (just as a reminder: "debunking" doesn't mean we disprove the claim made by the client, it just gives us a plausible explanation to present to the client as to what may be causing the claim). At several points during the first part of the investigation, we heard what we all though was whispering coming from the hallway, then it would stop. This happened again and again until we were able to track the sound down to the toilet tank in the main bathroom which was constantly trickling water leading to a matrix effect where it sounds like words. We popped the top of the tank off and adjusted the plug and never heard it again. Possible debunk #2: although the home is extremely well insulated from the neighbors vocal sounds, the sound of their front/back doors closing do cause a muffled bump that sounds like it's coming from within the home. Now, for the personal experiences which we tried and tried to debunk, but were unable to do. With two investigators standing in the grandmother's room, we asked "any entity present" to move something. about 10 seconds later, we heard a sound of something hitting the floor and discovered a thermometer box had appeared on the closet floor in the room. We reviewed our initial photos and discovered that this box had been firmly placed on a solid surface in the room (photos below). 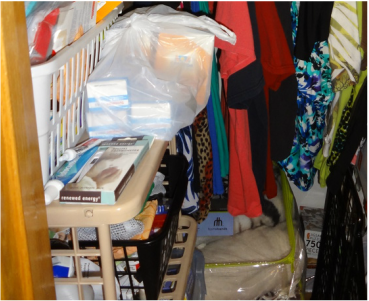 NO investigators were within 10 feet of this closet when this experience occurred. The item in question is the flat thermometer box which can be seen sitting on the surface of the shelf (next to the two medicine tubes). Once we heard the sound, we discovered that this box had been moved to the floor and this pic was taken. We exhausted every resource in debunking this one including door drafts (even though the closet door was open the whole time), jumping up and down and shaking the shelving unit, but to no avail. Did an entity move this item? We are not going out on that limb, but this one just remains VERY odd and unexplained. Personal experience #2 occurred with all four investigators taking a break on the driveway of the home with recorders/cams running inside. While we were discussing the case, the exterior garage lights suddenly went out and the street lamp went out at the same time (no other street lamp on the street was off and there were 12 of them). Inside the home, all electrical devices were working and the light to the main living room was able to be turned on. Minutes later, the lights came back on and all was back to normal. Again, was this a paranormal experience? possibly, but there's just not enough info to make that leap. Later in the evening, with 3 of the 4 investigators in the main living room, we captured another EVP which sounded like a conversation. Our 4th investigator was in the kitchen area and thought what we heard was him talking, but upon review of the recorder near him, we discovered that it was not him and was not his phone. We knew the sound was coming from the opposite direction from where he was the minute we heard it (it also came away from the shared wall with the neighbors). The audio can be heard below. Although we did have a few personal experiences and did capture a couple of unexplainable EVP's, we are unable to say with certainty that this home is "haunted". We understand that plausible explanations for our experiences and EVP's MAY exist, so for respect for Lizzie, our client, and her family, we have to say that this case remains open and cannot categorize the activity as definitely paranormal. We have asked Lizzie to keep us informed if the activity changes or escalates and are open to doing a return visit to the home if necessary. In the meantime, we have referred case (at Lizzie's request) to Reverend Crabtree for a cleansing. We will keep you updated on this case and remain in close contact with the family.